FUN AND EXERCISE FOR BOYS AND GIRLS! • Supports users 40 to 80 lbs. 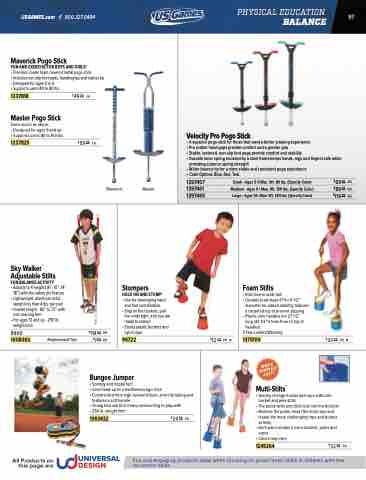 • Designed for ages 9 and up • Supports users 80 to 160 lbs. • Wider bounce tip for a more stable and consistent pogo experience • Color Options: Blue, Red, Teal. • Kids love to walk tall! • Springy and hoppy fun! Fun and engaging products ideal when focusing on gross motor skills in children with low locomotor skills.